Midweek Lenten Services will follow the Soup Suppers at 7:00. Please mark your calendars to come each Wednesday in Lent for fellowship and an inspirational service. Free daily devotionals for Lent are now available from Lutheran Hour Ministries and Higher Things. You may download to print at home, read on your e-reader, or receive daily via e-mail. Visit www.lhm.org/lent/ to get your free Lent 2019 daily devotional, ‘People of the Passion’ from Lutheran Hour Ministries OR ‘Reflections’, which is more geared to youth and young adults, from Higher Things. Did you ever wish that you could have been there at Jesus’ passion? Imagine what it would be like: to hear the crowds shout “Hosanna!” as Jesus rode into Jerusalem, to smell and taste the feast at the Passover, to see Jesus carrying His cross to Golgotha, to touch the nail-wounds in Jesus’ hands when He rose from the dead. We cannot do that, but the men and women who were eyewitnesses of these events have left their testimony in the pages of the Gospels. John tells us, “These are written so that you may believe that Jesus is the Christ, the Son of God, and that by believing you may have life in his name” (John 20:31). But there were silent witnesses, too—objects, animals and places that played a part during key moments of Jesus’ suffering, death and resurrection. We find them in the pages of the Gospels as well. Though they cannot speak, they can show us something of His love and mercy toward us. 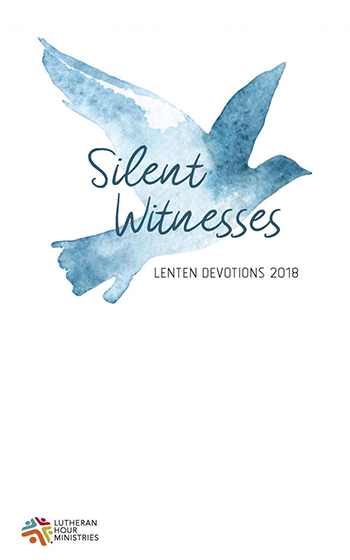 Available to read online or as a podcast beginning February 14, 2018, Silent Witnesses, Lenten devotions from Lutheran Hour Ministries, can also be received as an e-mail subscription throughout the Lenten season. The audio version will be available on the daily devotion page beginning February 14, 2018. To print or subscribe to the devotional, visit theLutheran Hour Ministries website.